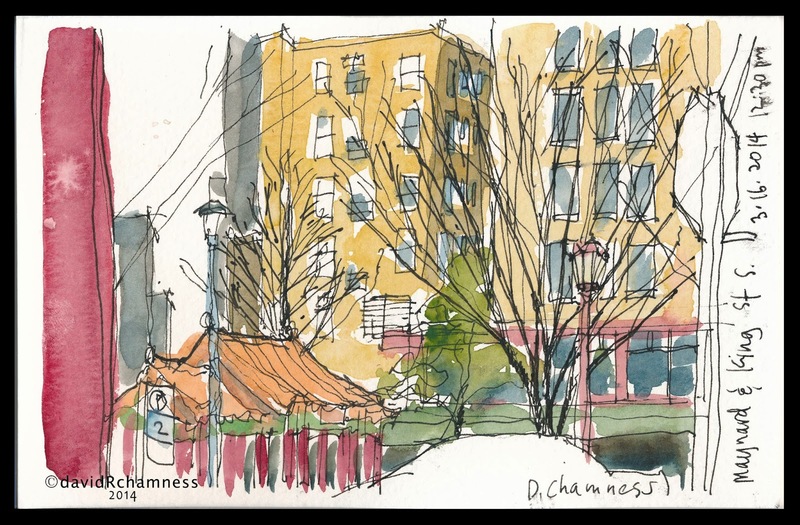 The rain was falling at a steady clip today as the Urban Sketchers spent the morning in the International District. I walked up King Street from our meet-up location by the Union Train Station until I found a dry, closed storefront (Golden Star Deli) entry on the corner of Maynard Avenue and King Street. I was interested in capturing a typical ID street scene (early century buildings with apartments/old hotels above retail establishments). One thing that was interesting, but unsightly, was the external exhaust ducts running up the side of some of the buildings. They serve the restaurant kitchens that dot the storefronts, like the Kau Kau Barbeque in the left foreground of this sketch. I wrapped up my time with a sketch of the Hing Hay Park and its Asian temple-like pagoda that was occupied by street people trying to find relief from the rain. The view was just looking to the left across King Street from my first sketch. The Bush Hotel was the yellow-colored building overlooking the park in the background. Those details are your talent for picking what tells the story. Great sketch!